Very simply put, Holly Phares absolutely, positively transformed my life. I was a shy, timid singer when I started studying voice with Holly. I figured that voice lessons would help me with my singing, but I had no idea to what extent; nor did I know how much I would grow as a person. The first things you notice when you step into class with Holly are her positive glow and refreshing personality. These attributes are so important in an educator because they enable students to be comfortable. (And singing in front of people is not always a comfortable thing!) Holly’s professionalism and style of education are sure to work for people of all ages and skill levels. Ms. Phares’ instruction enabled me to open up as a singer and person. My vocal technique was so dramatically improved that in two years my vocal range grew by an octave. By helping me realize my musical potential, Holly enabled me to change from a shy, timid singer to a boisterous, bold tenor!! I learned to take risks in the music field that also resonated in my personal life. Holly ignited a flame in my soul for music that will never go out. Her kindness and love for music are infectious. While studying with Holly I enjoyed amazing instruction and an even better friendship. As a cantor of a large Reform congregation in the Philadelphia area you are always on - singing, teaching and talking - which can lead to major vocal abuse. Working with Holly for many years has taught me how to stay healthy and protect my voice. I feel that with every lesson I’ve learned something new, perfected my technique and let my voice reach its full potential. Did I mention that Holly is a lot of fun, witty and wise beyond her age? I always look forward to my lessons. Holly Phares was a brilliant clinician for an Opera Company of Philadelphia master class offered for its National Opera Week celebrations at the Curtis Institute of Music. Ms. Phares worked with new and amateur singers with a wide spectrum of abilities. No matter what the singer’s abilities, she was able to enhance them, help the student become more aware of their vocal apparatus and how it related to their entire body, and more – all while honoring the singer’s needs and educating, enlightening and entertaining a fascinated audience! Making music with Holly is much more than singing--it is storytelling, laughter, movement, and fellowship too. With the warmth and grace of a natural teacher, Holly has helped me improve my visualization techniques and learn how to tune my voice in a small ensemble. Time spent in group song under Holly's direction--whether it's with the Tab Ensemble or a Soundings from the Heart workshop--is a highlight of my week. Holly helps us understand music as a means to center our minds and bodies on joy, and we all need more joy in our lives! Holly Phares is an exceptional musician who has a keen knowledge of the voice. Through her unique approach, she addresses the whole person - not only vocally, mentally, and physically but also spiritually. She has the uncanny ability to form immediate connections with people of all ages. I have seen her work with children’s choirs, high school students, and college music majors and in every situation she brought the students to a higher level of awareness, substantially improved their singing, and inspired them to greatness. Her sense of humor is hallmark and her enthusiasm is contagious. Holly Phares is simply a master teacher and has my highest regard. Holly Phares is an inspiration, a mentor, a friend, and a great teacher. She felt my feelings, encouraged me through difficult times and expanded my musicianship to levels I had not dreamed I could have reached otherwise. I had the good fortune to work with Holly as a choral singer and a workshop participant. She brings great passion and enthusiasm to all of her work. Holly helps singers to reach their full potential as musicians through her warm and thoughtful teaching approach. I look forward to every opportunity I have to work with Holly. Holly Phares is a singer, conductor and vocal mentor who brings to everything she does a rare combination of musicianship and an all-embracing humanity. Our history goes back a long way, beginning when she sang under me in the Westminster Choir in the early 80s, and she is still a wonderful solo artist. More recently, during the summers of 2010 and 2011, as a guest conductor for Umbrian Serenades in Spoleto, Italy, I watched her repeatedly transform the sound of a very diverse group of singers through not only her deep understanding of how the voice works, but even more inspiring, her warmth and her great human understanding, as well as her extraordinary ability to intuit the needs of every person in the group. And all of this is infused with her abounding love of people and her deeply-rooted desire to help those with whom she works to grow as singers, as musicians, and as human beings. I am deeply honored to have experienced several facets of Holly Phares' brilliant and generous musical skill. A highlight of my professional career was being a founding soprano in Bobby Mcferrin's touring ensemble, Voicestra. After years of neglecting my voice while caring for my aging father, I turned to Holly's vocal coaching to reclaim my voice. She suggested an astonishing range of vocal and physical exercises to help me re-establish resonance and fluidity in my singing. She also trained my ear to hear what might be possible again for my voice by suggesting other vocalists for me to listen to. And the strategy worked! Holly's skillful ease with bringing out the music in professional and community voices knows no apparent bounds. I've experienced her skill in private lessons, as a director of music at her church, and in a "community sing" at Occupy Philly. 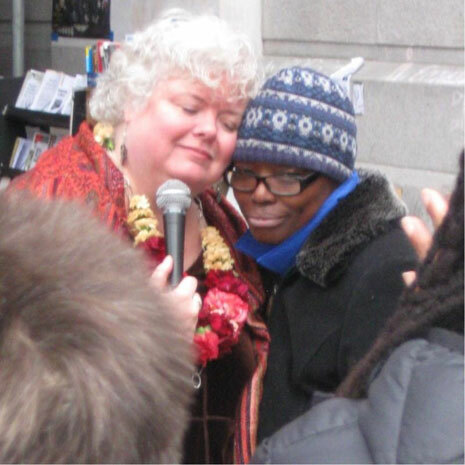 During the latter, Holly gracefully held the space for a homeless woman to soulfully sing out a rendition of “Lean On Me” that captivated the crowd. As a truly gifted practitioner and teacher of the vocal arts Holly embodies the liberating power of song. Holly Phares guides, inspires and releases you to share your voice with the world. From the novice to the professional singer Holly's approach sets singers free. You will soar to some of your personal best singing under Holly Phares' guidance. Having had the pleasure of working alongside Holly for more than a decade I can attest to the extraordinary level of her musicianship the enormous heart she brings to everything she does. Although she is in her own right an extremely gifted composer, singer and choral director, she places her musical gifts in the service of healing and transformation for others, calling forth their authentic voices and in the process helping to liberate their spirits -- and she does it all with creativity, humor, humility and compassion. She is a healer, and music is her medium. I cannot recommend her highly enough. I felt Holly’s personal magnetism the first time I met her – which was when I tried out for Umbrian Serenades. I was a newcomer to the world of singing and painfully unsure of myself, but Holly immediately made me feel at ease and enthusiastically supported. In Umbrian Serenades, Holly’s skills as a teacher, musician and group leader as well as her always sunny disposition and unbridled enthusiasm transformed a group of singers of all shapes, sizes, training, and experience into a cohesive, balanced ensemble who made beautiful, joyous music ring through the ancient acoustics of Italian churches. As my teacher, Holly has become my cheerleader, technical trainer, personal friend, and spiritual connection to the essence of music. Holly has brought out a voice in me that I didn’t know was even possible. I have also participated in some of Holly’s workshops, which could more accurately be called funshops; in them Holly provides a playground for voices. We chant, improvise, experiment, let loose, and make joyful noise and ultimately understand ourselves and each other better. Working with Holly is an exercise in holism. Holly approaches her students, workshops and rehearsals with such broad understanding, deep compassion, and great enthusiasm that students and participants cannot help but become more aware of the connections between their physical, intellectual, emotional, and musical selves—not to mention the connections she facilitates with and among other people. Her joy in making music and using music to create community have inspired me on many occasions. Holly does not simply "teach voice"; she "teaches living." 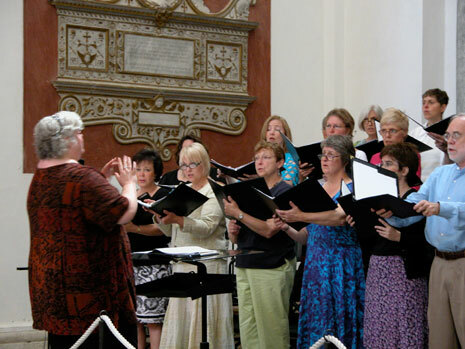 I have had the utmost pleasure of singing with Holly in Italy as a member of the Spoleto Festival Chorus and as associate choral conductor of Umbrian Serenades. Holly radiates joy. Her passion for touching people through song is extraordinary. Her expert, gentle guidance is such a gift. Through her generous spirit and compelling belief in you, she extracts qualities you didn't know you even possessed! I have known Holly as a colleague and friend for over 20 years. She is one of the most loving, creative, and hilarious individuals I have ever met, and I am grateful to call her one of my dearest friends. My most recent adventure with Holly was participation in her lovely workshop “Soundings from the Heart.” Her classroom is a portal to an ideal world--the world of the creative spirit, of gentle vigor, and vibrant healing through song. Holly brings people from diverse walks of life together, and knows at once how to make everyone in the room comfortable. In Holly’s classroom there is both a place for the beginner and the accomplished professional, and in one and the same moment, both are able to “get” what they need from her instruction. As an educator myself, I am always challenged to meet diverse students’ needs, differentiating my instruction for students of varying levels of ability. Holly is a master of this. Her ability to connect on multiple levels, her ever-ready wit, and her buoyant, warm heart are fresh air for all! I was recently asked to describe a good teacher in 6 words. What popped into my head was, “She helped me find my voice.” And then I realized I was thinking about Holly. I had come back to choral music after many years away. As a new empty-nester I knew what I wanted to do: join the choir of my church where Holly is the choral director. In rehearsals and performances alike, Holly has been able to coax a quality out of our ensemble that continues to surprise us. She weaves musical integrity, a commitment to excellence and a deep joy into her work in ways that are contagious. We sing better than we thought we could and laugh more than is probably legal. Sometimes we touch something beyond ourselves or most deeply within us that must be Holy. I highly recommend participating in any musical endeavor Holly is a part of. You too might find your voice. Working with Holly Phares was a composer’s dream. She beautifully prepared the children’s chorus for a premiere of my cantata, The Long Bright, with passion, enthusiasm, sensitivity, musicality, knowledge, deep experience and commitment. In addition, her unique gift to draw out the very best from each singer challenged them to rise to their potential in the most life-affirming and nourishing ways – she really knows how to connect with youth and the chorus sounded fantastic! I highly recommend Holly as a music director, singer and teacher. Before studying with Holly I had only scattered experience in different church choirs and a cappella groups. She was immensely helpful as a voice teacher, teaching me to inhabit my body more fully, and through that, making my sound fuller and richer. She has a very intuitive style of teaching, using plenty of humor and metaphor and plain good sense to convey how to change your breath, your bad habits and your expressions to fit both the music and your own body. I have always loved how she talked to me instead of at me, about my issues with breath and relaxing. I definitely would not nearly be the singer I am today if I had not met Holly Phares. She is an extremely positive, inspiring and kindhearted person. I am lucky to have had her as a teacher. Holly's teaching and workshops are consistently an invitation to deep joy and freedom of voice! She blends an extraordinary wealth of professional musical expertise and vocal coaching with tools for personal growth and helps participants draw on this powerful resource we have with us always! Have you ever felt that feeling of walking in a room and fearing the consequences of what might happen? Not knowing what people would think, would they laugh at you, or how would they judge you? My name is Maximilien Baud I had spent 20 years of my life training or performing in the world of ballet. Suddenly, I was offered the opportunity to be part of a Tony award winning show called "Billy Elliot." Me, the dancer, had to become the dancer/actor/singer. I felt confident about the first two roles but thought, how would I ever be able to accomplish the latter? Luckily for me, the producers of the show had chosen Holly Phares to be my guiding light. From the moment I walked through the door and met Holly I knew that this would be the person who would believe in me and make me the best singer I could be. Not only are her skills resounding, but she knows how to reach into your soul and bring the best out of you. The summer of 2010 might not have been the summer I became Pavorotti, but it was the summer where I faced my biggest fear and became the best singer I could ever be. Holly is a great instructor. I would recommend her again and then again 10 times over.